If your pet is either a puppy or kitten or on the older side, it may not be the best idea to bring them on vacation with you. This is especially the case if they have any health concerns or struggle with a new environment. While you may feel a pang of sadness leaving them at home, this may be the best option in the long run for their health and safety. 2. Driving to your destination? Put your pet in a crate for both your safety and theirs. No one wants a frantic or excited pet climbing over them while they're driving! Give them a blanket and a couple of their favorite toys to make their crate experience comfortable and distract them from potential travel anxiety. Be sure to stop at rest stops aong the way for bathroom, food and water breaks. A pet who sits too long in a car may engage in bad behavior. Keep the windows rolled down if it is warm outside. It is vital to your pet's health that they are in a vehicle that is properly ventilated. Each airline has their own rules. Be sure to call in advance so you know what to be aware of when prepping your pet for your trip. Make sure to bring your pet's health forms! All airlines require this documentation. Double check that your crate is airline approved if they are being transported in the cargo section of the plane. If you have a small cat or dog, they can sit under your seat in a carrier bag or crate. If you are planning to travel by bus or train, we are saving you the trouble in advance. Unfortunately, pets are not allowed to travel on Amtrak trains or Greyhound buses, as well as other bus companies. If you are traveling by boat, you may have better luck! A few cruise lines offer special lodging for your pet, but we recommend calling the cruise line before you plan on taking your cat or dog to travel with you. When you arrive at your hotel, ask the hotel staff where you can walk your dog. Once they tell you, be sure you pick up after your dog! This is an important rule to follow anywhere, but especially at, or near the hotel. Be respectful of other guests at the hotel. Make sure your pet isn't too noisy and doesn't make any messes in the room. Do NOT leave your pet unattended because pets, dogs especially, are known to make messes or even destroy the property when left alone in a strange place. Once you get to your destination, take your pet out to explore all the new sights, sounds and smells of the area! Do your research prior to the trip to locate any local dog parks, beaches or walking trails that both of you can enjoy. 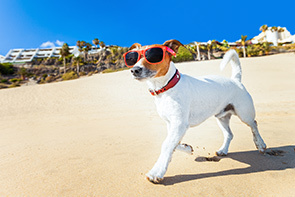 If you want to bring your beloved furry friend on your next vacation, our tips and advice can help you plan everything from hotel accommodations to car travel with ease!